An independent evaluation of the ICURe programme, conducted by Ipsos MORI, has evaluated the spin-out programme’s impact on the UK economy revealing excellent results. 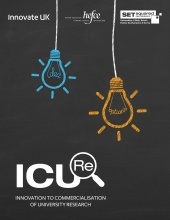 Established in 2014, the ICURe innovation to commercialisation programme offers support to teams of academic researchers wishing to explore the commercial potential of their research. Essentially it enables them to get out of the lab and pitch their research to potential commercial customers. 78 teams benefitted from the first six rounds of ICURe at an approximate cost of £2.4m. Participation in the programme increased and deepened links between participating academics and industry, accelerating the commercialisation and the technology development process. An estimated 24 additional spin-outs were created, with an average age of one year at the time of this evaluation, raising a total of £6.9m in private equity finance. This valued the businesses at a total of £35m. A larger proportion of Aid for Start Ups recipients reported they had secured private equity investment than those spinning-out without public funded support (74 versus 31%). Spin-outs employed an average of three workers and were generating an average of £86,000 in revenues by January 2017. Spin-outs taken forward with Aid for Start Ups funding grew more rapidly, reporting an average of six FTEs employed and average turnover of £145,000. The ICURe programme is estimated to have created £3.94 of economic benefits for every £1 invested to date. (The study interviewed 100 non-selected and 220 selected participants to give a comparison).